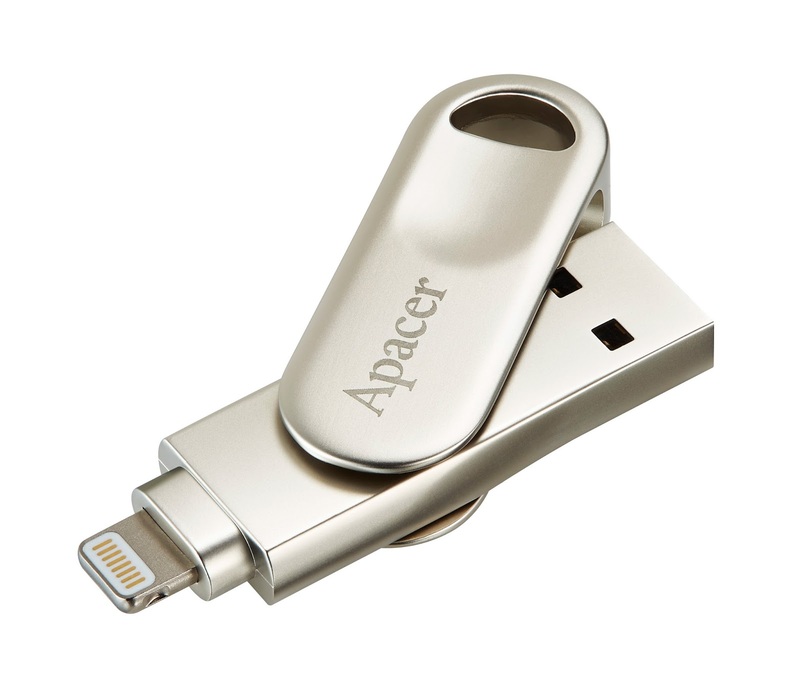 Apacer, a mobile storage solution expert, introduces AH790 dual interface swivel flash drive for iOS devices. Aesthetically built with zinc alloy and equipped with USB 3.1 Gen1 Type-A and Lighting connectors, AH790 is the speedy solution for file transfer between your PC and Apple devices. Paired with the Apacer iFileBridge app, you can manage your files efficiently with several exclusive features, such as “one-touch backup”, which instantly frees up your phone memory as you backup your files, or “capture-and-store”, which saves photos and videos directly into AH790 without ever occupying space in your phone. AH790 is an MFi certified product, fully compatible with iPhones and iPads. AH790 is equipped with Apple Lightning and USB 3.1 Gen 1 Type-A dual interface. It is easy to transfer data between iOS devices, desktops, and laptops just by swivel and plug actions. During use, the extended length design of Lightning connector facilitates easy insertion into any device, without having to remove a mobile phone’s protective cover. AH790 is built to overcome memory limitations in Apple products. iFileBridge, an exclusive app designed by Apacer, works to easily manage the files in mobile device and in AH790. The “One-touch backup” function can duplicate data from device to AH790, keeping all of contact list information, photos, and videos fully stored, while releasing your phone’s memory space. When performing memory-intensive actions such as photos and video recordings, there is no need to transfer files from your iPhone to AH790. With the “capture-and-store” feature, simply take high resolution pictures and videos and save them directly to AH790. Or you can use your AH790 as a personal theater; save the movies you want to watch, and let iFileBridge App play the video for you. Zinc alloy is adopted to characterize AH790 with a quality and durability that is in line with the aesthetics of iPhone and iPad. The 360-degree swivel cap is designed to pause at four directions to make the spin more precise, always keeping the Lightning connector protected when not in use. The integrally molded strap hole is functional: you can attach your favorite accessory and turn your AH790 into a personalized charm. Certified by Apple MFi, AH790 functions with a superb quality. It is available in two memory capacities: 32GB and 64GB. With the potentials opened up by AH790, users can rest assured that their enjoyment with iOS products will no longer be limited by the default memory!